“Ecuador, a green world behind the sun that lives in the shadow of volcanoes” is the country with the richest biodiversity per square mile in the world, located in the northwest of South America”. VISA: Anyone from any country is entitled to an “automatic” 90 day tourist visa (12-V). If you plan to stay longer, you will need one of the other types of visas for a stay of over 90 days. 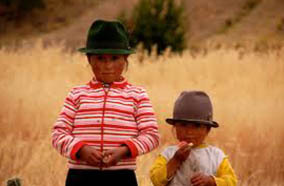 Ecuador is a multi-ethnic and multicultural country. We have more than 14 indigenous groups living on the Ecuadorian mainland, maintaining their own languages, culture and ways of life. Ecuador straddles the Equator, from which it takes its name, and has an area of 256,371 square kilometres (98,985 sq mi). Ecuador is among the 17 most diverse countries in the world, because of its geographical, biological, and cultural diversity. 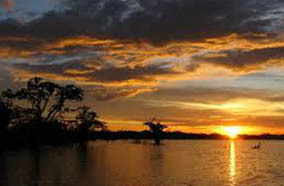 As a visitor you can easily travel to each of Ecuador’s four regions because of the small size of the territory. Only in Ecuador can you cross the Equatorial line, climb the highest active volcano in the world, kayak the rapids of the Amazon rainforest, cross fascinating rivers by zip cable , surf the waves along the sun Pacific beaches , sea lions and harmless whale sharks – all in just one trip!. Ecuador is an incredible sustainable, paradise because of its commitment to protecting its sustainable tourism in natural, cultural, and human mega-diversity . Cotopaxi is the highest active volcano in the world and the most popular mountain in South America. 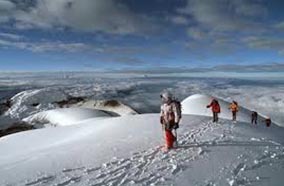 Its Quechua name means ¨Shining Peak;¨ at 5897 meters above sea level. Thousands of climbers visit it each year for a fabulous view of the 800m diameter crater. The mountain is characterized by quite stable weather conditions. Otavalo, located in the province of Imbabura. It´s traditional Saturday market is considered the biggest Indian market of South America. 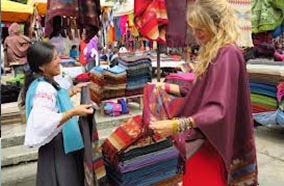 The friendly Otavaleños are renowned for their textiles; you can also find leather goods, fine art, and jewelry for sale. 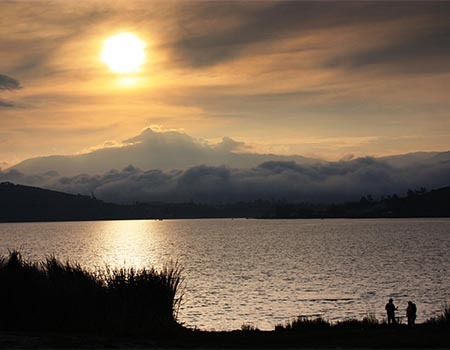 The town is surrounded by beautiful lakes such as Lago San Pablo and Laguna Cuicocha. Quilotoa is a water-filled caldera in the westernmost volcano in the Ecuadorian Andes. A deep crater lake, which has a greenish colour as a result of dissolved minerals. Fumaroles are found on the lake floor and hot springs occur on the eastern flank of the volcano. The tour takes hikers through several points over a day or two. One can also find mule- or horseback riding in the area. One of the most-visited cloud forests in Ecuador is the natural Reserve Mindo-Nambillo Protected Forest 14,170 hectares (35,000 acres). Some 400 species of birds have been recorded here. The town offers a variety of lodging and dining. 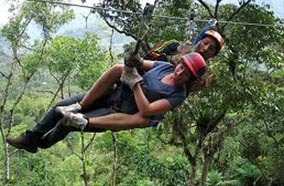 There are lot of activities on offer as well as birding: you can go tubing on the rivers, horseback riding through beautiful scenery, hiking in the forests, or soaring between the trees suspended from a canopy line. Accommodation: Enjoy your stay at the Dragonfly Inn – located in Mindo, Ecuador. This new addition to Mindo lodging features clean rooms finished in wood, private baths, hot water, comfortable beds and outdoor balconies. 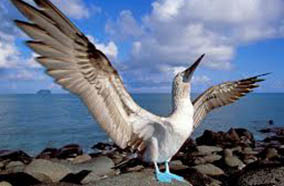 The enchanted Galapagos Islands are located in the Pacific ocean some 1000 km off the Ecuadorian coast. There are 13 large islands, 6 smaller ones and 107 islets and rocks. The islands are volcanic in origin . Giant Galapagos tortoises meander distant highlands, and prehistoric marine iguanas sun themselves on black lava rocks along the shore. Cormorants and tiny penguins dart through the waters while graceful red-billed tropicbirds screech across the sky. Explore the island´s ecosystems as you inch past lounging sea lions, scout for breaching whales offshore and pink flamingos in hidden lagoons.